Published in the winter of 2014 by Red Moon Medicine, Vacant Ritual Assembly #1 is the first issue of ‘An OSR Zine’ devoted to Lamentations of the Flame Princess Weird Fantasy Roleplay and the campaign of the author, Clint Krause. If there is a focus for this inaugural issue, it is upon certain aspects of magic that do not feature in Lamentations of the Flame Princess Weird Fantasy Roleplay. The first is the acquisition of magic items, in the author’s campaign available at the Ghoul Market, a roving underground collection of traders who source magic items from high and low—mostly low. Items such as Wind Whales (2000sp) and the Ostritch-like Ergoraptor mounts (1000sp) add an expensive if outré element to a game, whilst Fairy Amber (3000sp per piece) can be bought and embedded in arms and armour to gain a bonus, though if too many are used there is the chance that the bonus will be lost. Also seen at the Ghoul Market, is the Skinsmith as detailed in ‘Meat the Skinsmith’. This demonic and corpulent being provides surgeries—replacement limbs and even resurrection of the dead, though this comes at a terrible price, the possibility that the resurrected returns to life with the head of a bull, a demonic face in each palm that whispers ill to the resurrected, or even with his non-vital organs replaced with internal ‘pockets’ for the easy storage of small items. A regular customer at the Ghoul Market is detailed in ‘Vespero the Antiquarian’, a fixer who arranges for the finding and obtaining of objects and artefacts, perhaps employing adventurers such as the player characters to do so. He will have magic items for sale too, a different inventory each time he opens up shop. Both of these NPCs would make sold additions to a more fantastic style of campaign Lamentations of the Flame Princess Weird Fantasy Roleplay as they both retain the dark horror elements intrinsic to the RPG. ‘Luminari, Lady of the Golden Lamp’ provides a respite from the horror. It details a possible roleplaying encounter deep in the forest with the goddess of fireflies and is easily dropped into most campaigns. Perhaps the highlight of Vacant Ritual Assembly #1 is ‘Brahnwick is Dead’. This scenario starts with the player characters being hired by Vespero the Antiquarian to recover a signet ring from the late Lord Brahnwick as part of a succession dispute. To do this they must visit the Brahnwick family seat of Sylvan Lake, a village that has been partially drowned following the collapse of an ancient dam and infested with escaped patients from an asylum, the House of Mercy. The scenario sees the player characters boating across the submerged valley, going from one building to the next, and diving down to the lower floors whilst dealing with the escaped and insane inmates and scavengers. The scenario has a pleasing feel to it because it is a relatively mundane affair barring the upside down environment. Now there are ‘weird’ elements to the scenario, but they are kept to a minimum and the scenario is all the better for being underplayed. This also makes the scenario easy to drop into another setting, even the Early Modern period setting seen in official scenarios from Lamentations of the Flame Princess Weird Fantasy Roleplay. Rounding out the first issue is an interview with Chris McDowall, the author of Into the Odd, the post-industrial age dungeon exploration RPG. This is rather a decent advert for the game and it got me interested in reviewing the game. It is followed by a map of ‘Greycandle Manor’, an abandoned priory turned manor house now awaiting the GM to populate it, accord it a plot or two, and drop it into his game. Fanzines can of course vary greatly in quality since they are not produced by professionals, but to a certain extent, there is no excuse for poor layout as desk top publishing has been available for decades. Fortunately, Vacant Ritual Assembly #1 s reasonably laid out and on the whole is rather serviceable. The writing is clear and the author pleasingly takes the time to describe how each of the pieces in the issue played out in his campaign. 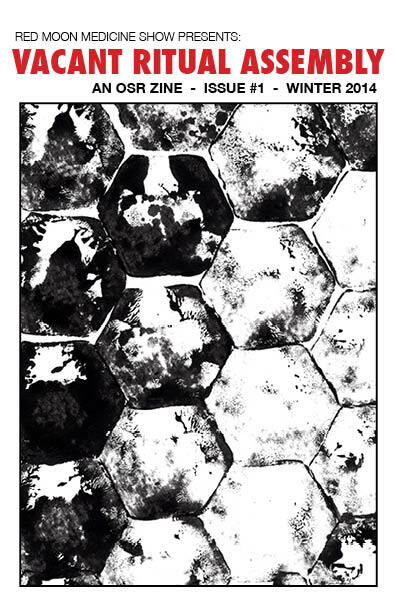 As the first issue—of which there are five to date—Vacant Ritual Assembly #1 is a solid affair. It contains elements that are all connected. Both Meat the Skinsmith and Vespero the Antiquarian to the Ghoul Market, and Vespero the Antiquarian to ‘Brahnwick is Dead’, but at the same each is easy to separate from these connections to be used on their own. Good support for both Lamentations of the Flame Princess Weird Fantasy Roleplay and for darker Old School Renaissance campaigns from the off—let us hope that the next issues will be as good.